Every year the kids’ school has a big celebration at the end of October for Nations Day. Each class picks a different country to study during the month of October. This year Reagan studied Mexico. The most exciting part for Reagan so far has been learning some spanish words. I would pick her up from school and she would say, “Hola Mama. Are we going to mi casa now?” Or shout “Adios” as I dropped her off at school. She also learned her colors and numbers in Spanish. She was really excited to show off her new skills. 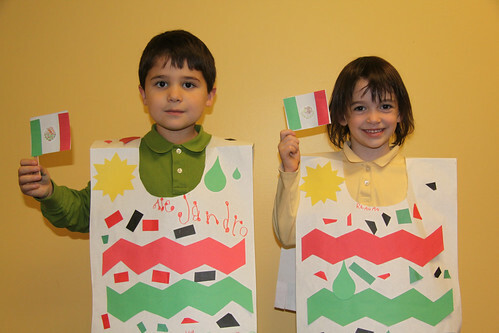 Her class celebrated Nations Day with a Mexican Fiesta and a pinata. They also made several Mexican crafts. Kindergarteners don’t perform a skit for the celebration, but they do get to dress the part and participate in the parade. Here is Reagan adn her bud Ale in the handmade ponchos. Nations Day Parade from Brandon Fuller on Vimeo.